Rebound controls the speed at which the fork extends after compression. Rebound damping control is relative to the amount of air pressure used. Higher air pressure requires more rebound damping and lower air pressure will require less rebound damping so please adjust accordingly. Why do you need rebound? What happens if your rebound is too fast? If rebound is too fast, your wheel will fall into more holes, instead of skipping over the top of them. Handling will feel twitchy and hard to control, it will be easier to be thrown out of control on jumps and landings. What happens if your rebound is too slow? If rebound is set too slow it will pack on successive hits because the fork cannot extend fast enough keeping you in the mid stroke. This will result in the wheel going deeper into the travel on every hit and riding towards the end stroke. The Diamond comes with a “Quick Range” low speed compression adjuster that has 6 clicks of adjustment. Setting “1” is wide open and recommended when descending or riding on technical terrain. When you are climbing, you can switch the LSC to “6” to give you the firmest setting and best pedaling platform. Don’t forget to change this back when you start to descend! Low speed compressions controls the slower vertical movements such as climbing or slower paced trails and bumpy whoop sections. A good example of low speed is rolling slowly over a large rock and riding to its downside, this is where the suspension will fully compress but at a slower rate and low speed compression circuit comes into play. LSC refers to the shaft speed of the suspension and not the actual riding speed. LS compression is best controlled through a low speed oil circuit and or shim stack. Why do you need Low Speed Compression? 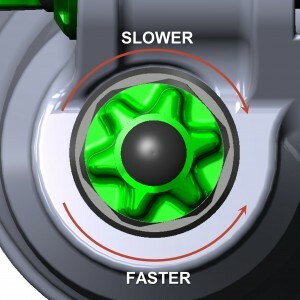 Low speed compression affects the suspensions performance when the shaft is moving up and down at slow speeds. Low Speed affects small bump performance and controls dive under breaking. What happens if you have too much Low Speed Compression? Too much Low Speed Compression will result in harshness over small bumps and traction will be reduced. Turning performance may also suffer because the suspension will ride to high in its travel. Ride may become harsh. What happens if you don’t have enough Low Speed Compression? Not enough Low Speed Compression will result in the front end diving to quickly under braking. The suspension will have a mushy feeling and may bottom out to easily. 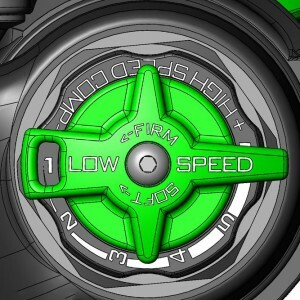 High Speed Compression controls the damping force under faster suspension movements regardless of the rider’s speed. HSC comes into effect on fast, rough, technical trails, g-outs and hard landings. If you find yourself easily going through the travel then 1st make sure your sag is correct then adjust your HSC accordingly. Why do you need High Speed Compression? High Speed Compression damping affects the suspension when the shaft is moving up and down at high speeds. High Speed Compression helps with large impacts or sharp/sudden impacts. High Speed Compression can be used to reduce bottom. What happens if you have too much High Speed Compression? Too much High Speed Compression may result in the fork not being able to reach full travel, and or spiking on large impacts. What happens if you don’t have enough High Speed Compression? If you don’t have enough High Speed Compression, The fork will blow through it’s travel to easily on jump faces, and will bottom out to easily on large impacts.